Being close to South Bend, Indiana and having heard of Notre Dame University all my life we decided to drive down and tour of the campus. I was impressed with beautiful well kept grounds. The famous Gold Dome and statue Of The Virgin Mary on top is a well known landmark. We toured the bookstore and saw the many items ranging from text books to Fighting Irish themed clothings. We took a walking tour with a friendly young lady who is a sophomore at the University. She said they have about 16 female dorms and 17 male dorms. The Basilica of the Sacred Heart is a beautiful ornate place of worship with the stained glass windows first installed In 1893. Our final stop was The Hesburgh Library featuring Jesus depicted in a famous mural as the “Word of Life” facing Notre Dame Stadium. 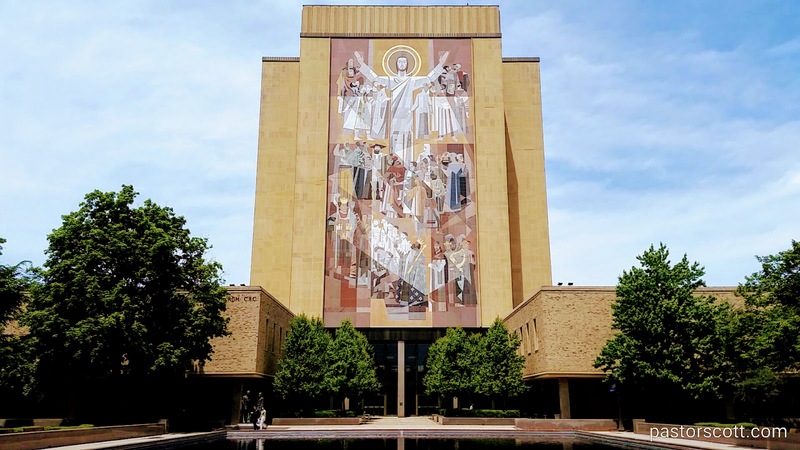 This giant mural is better known as “Touchdown Jesus”. There is much more to see on campus should you decide to visit. Here’s another review of this area. Here’s yet another review of this area. We also enjoyed our day in St. Joseph, Michigan. This city is at the mouth the St. Joseph River on Lake Michigan. Many people were enjoying the Silver Beach County Park. This park offers wide beaches with playgrounds for kids of all ages. There were several volleyball nets. We saw lots of children playing in the water at the Whirlpool Compass Fountain. They were having a blast being sprayed with with water shooting up from the floor for them to run through and stand under and huge water cannons shooting across the park on timers. There is also a paved trail above the shoreline with benches to sit on and enjoy lake view. From the river walkway we could see the two lighthouses called Range lights at the mouth of the St.Joseph River. They were built in 1907 when the pier was lengthened. A major attraction of the Park is the Silver Beach Carousel open year around and along with unique handmade horses. It features a rocking peacock and sea serpent benches that are wheelchair accessible. This is a great area to visit and I know there is much more to see. In fact, I’ll have another review of the area as we continue our visit in the vicinity at a different campground next week. See individual photos and captions here. This entry was posted in Jackie and tagged Children, history, Indiana, Michigan, nature, review, sightseeing. Bookmark the permalink.